Public opposition is mounting against a proposed windfarm in Angus. Nearly 100 objections have been submitted to Angus Council against the Govals Farm windfarm application, which was sent to the local authority in July. The plans to build six 87 metre wind turbines at the site south-east of Glamis were submitted by consultancy firm Green Cat Renewables on behalf of land owner David Cooper. Members of the public began to make their feelings on the plans known after a consultation evening held in July and opposition continues to increase as a family living near to the proposed site have taken their own measures to make their feelings known. 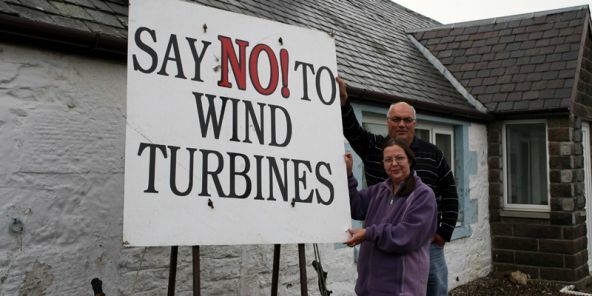 Gateside couple Heatheranne and David Low have objected to the proposals and have erected a sign outside their house which reads, ‘say no to wind turbines,’ to make sure everyone in the area knows their feelings. Heatheranne told The Courier: ”We feel that putting these turbines up is going to spoil the view – not just from the house but from the whole countryside. ”You will be able to see them from the surrounding area and the traffic going through the area is going to increase. ”A few people are happy about it but the majority of people I’ve talked to are up in arms about them going up. A spokesman for Green Cat Renewables said: ”Our plans have been carefully put together, and we welcome the fact that they are being considered in detail by both the consultees and members of the public. ”We have worked hard to achieve the best layout for the windfarm, and feel we have settled on the right balance between energy production and environmental considerations. The application for Govals is one of a number submitted by various companies seeking permission to build wind turbines in Angus. The latest is for the erection of a 79.6 metre turbine at the Hill of Stracathro, Brechin, submitted by the Greenspan Agency Ltd on behalf of Stracathro and Careston Estates.